It's been an interesting start so far to the MTB College Sports Bucket List as the first two games are probably ones folks outside of those involved in the programs may not know too much about and we hope you've explored them a bit more. Well, today we may just be breaking out of that particular mold. In fact we're breaking out of just about any mold you can think of with this one. But first, don't forget to take a gander at No. 99 on our list - Adrian vs. MSOE in DIII Hockey. So, who slides in at the No. 98 spot on our spring/summer long journey across the best games/events in college sports? Hint #2 this one is in the South! 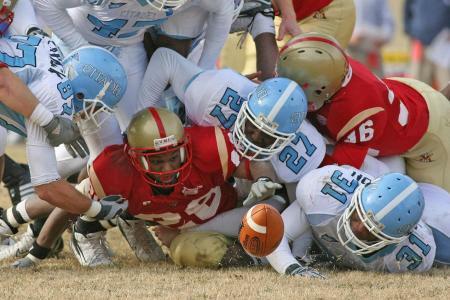 We've already highlighted one of the service academies, but this has a whole different twist on it and we're talking about The Citadel vs. VMI - a.k.a. "The Military Classic of the South." Since 1920 these two teams have only missed games in 1956, 2004, and 2008-2010. As a result it is the 13th oldest rivalry in FCS football. These two schools both represent great Southern Military traditions as well as great educational institutions. Besides pride in their traditions and hard lives led by the cadets at these schools they both were founded as public institutions and have a great level of support from the surrounding communities and alumni. On the field this has been a pretty fierce rivalry and only twice has their been any sort of separation in the series, a series that The Citadel leads 35-30-2. The Bulldogs only lead the series by that margin thanks to winning 5 straight over the Keydets of VMI. However, VMI holds the longest winning streak in the series, winning 7 straight from 1950 to 1957 and held an 18-8-1 advantage over the Bulldogs of The Citadel in 1967. Also, this series has been tied across the board 4 times in it's history. As with Army vs. Navy, these two schools aren't very fond of each other and they play ever year for the "Silver Shako" trophy which was introduced in 1976. What more could you want out of a rivalry than for it to be competitive and between institutions that are rooted in the communities they represent.